My first experience with one of the members of the Castilleja genus was with the more commonly seen red Castilleja indivisa (Texas or Indian Paintbrush). 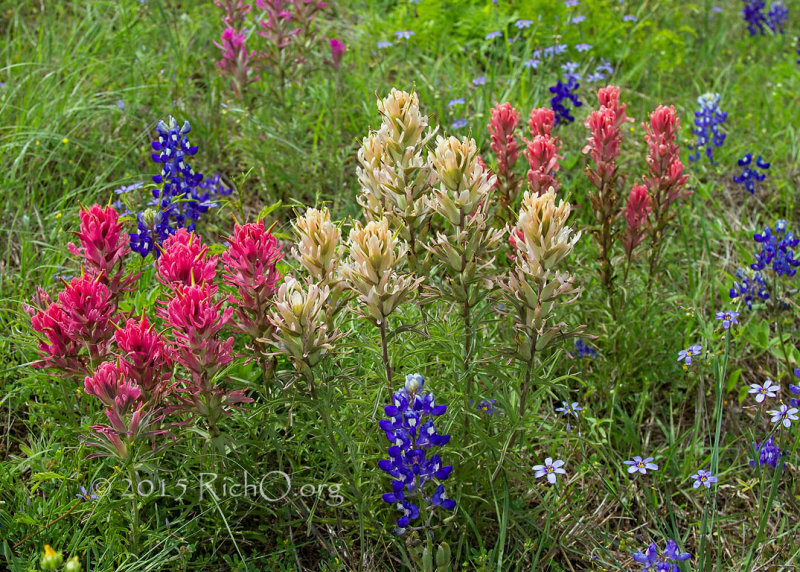 It wasn't until later, I finally found the Castilleja purpurea (Prairie or Downy Paintbrush) which to me is really more like a paintbrush in colors and shape. I have yet to see an entire field of Castilleja purpurea which I have seen with the Castilleja indivisa. Perhaps one day I will get the pleasure. I love finding a wildflower in its full glory as well as up close in smaller groups. Locations found: RR-501 between Pontotoc and Cherokee, Texas, US 87 between Fredericksburg and Mason, Texas. Legends: American Indian (possibly Cherokee) legend says that a young boy who could not become a warrior because of his size was encouraged by his father to paint what he saw. The boy decides to paint the colors and beauty of the sunset. In one version of the legend, the Great Spirit gives the boy brushes of paint from the colors of the sunset. In another version a woman gives the boy a white canvas from a deerskin. As the boy tries to paint the sunset, he tosses each paintbrush with a different color of the sunset to the ground. And there where each brush landed, a wildflower of that color grew and spread across the landscape. So, each spring the colors of the sunset are laid across the land as a reminder of the passion of that one boy who wanted so much to capture the color and beauty of a sunset. Uses: Contains selenium and was reportedly used by some American Indians as a hair oil. Some used for medicinal purposes.